It was our third day in South Africa and we were on our way from Pilanesberg National Park to Parys, a small town southwest of Johannesberg. Parys is Afrikaans for Paris. “I bet it even has its own Eiffel Tower”, I joked. To my surprise, Kate, our South Africa Tourism host, turned around and said, “yes, as a matter of fact, it does!”. We had a good laugh about it while my mind churned out all sorts of less-than-flattering adjectives. It was a long drive and thanks to our wifi-equipped van, we started tweeting about our visit. Kate sent a tweet asking for suggestions of things to do and see in Parys. Within moments, a guy named Bertrand responded and offered to show us his town. 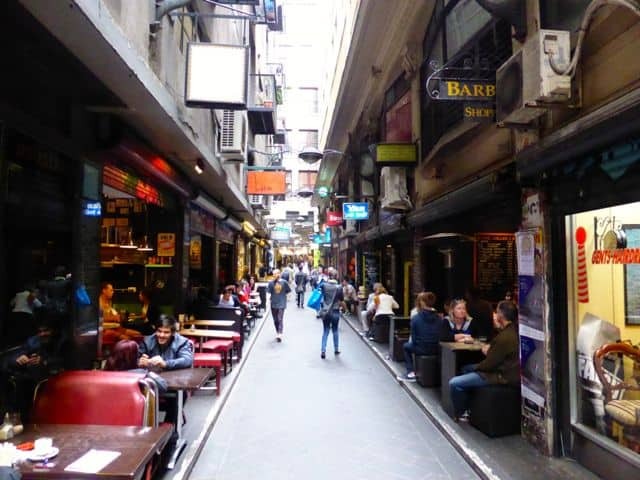 @kate_els5454 How does local microbrewery beers, lunch, missioning through town, meeting some of the friendly locals sound? Who will join? And that was the start of a simply unforgettable day in Parys! 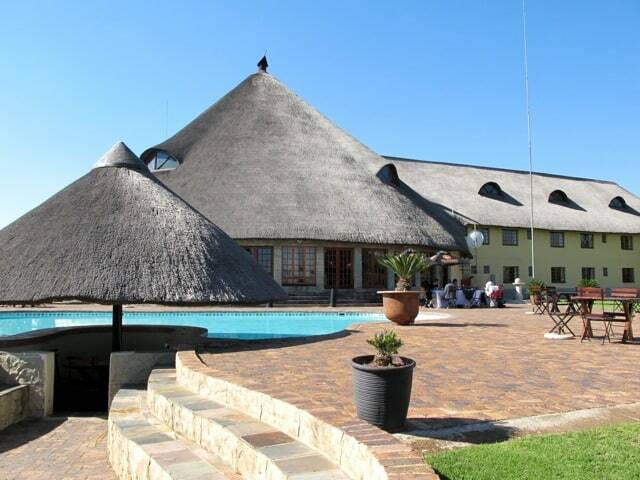 We arrived in Parys and headed straight for our accommodation, Stonehenge in Africa Lodge. “What? There’s a Stonehenge in Parys?” My initial thoughts of a quirky town were firmed up in an instant. As we drove up to the lodge, we passed the massive menhirs standing erect like their counterparts in England. A springbok and a few meerkats sprang across the road, a simple but effective reminder that we were indeed in Africa. We entered the lodge to find an impressive atrium with a beautiful fireplace in the middle. I walked outside and was greeted by a gorgeous lawn, a smattering of palm trees and a swimming pool. In the distance, I could hear and see the rapids of the Vaal River. The surroundings were absolutely lovely. 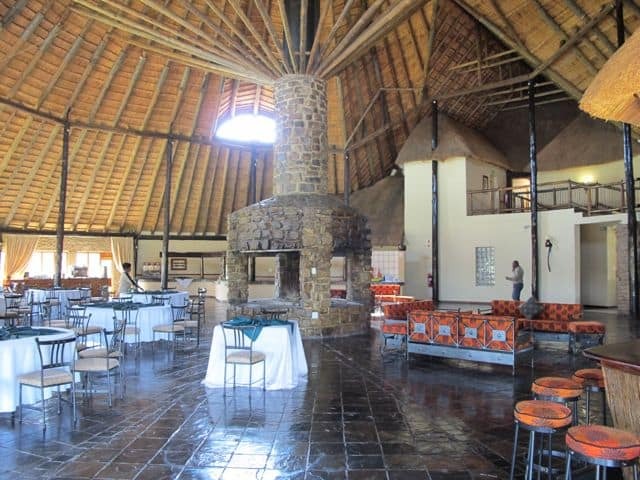 Inside the impressive Stonehenge in Africa Lodge. The pool at the Stonehenge Lodge. The Stonehenge in Africa Lodge. Bertrand came to pick us up at the lodge. He approached us with a big smile and welcomed us to his town. I soon found out that he’s been a reader of my blog for more than a year, and that he’d taken the afternoon off from work to show us around. That just blew me away. I mean, how cool is that? 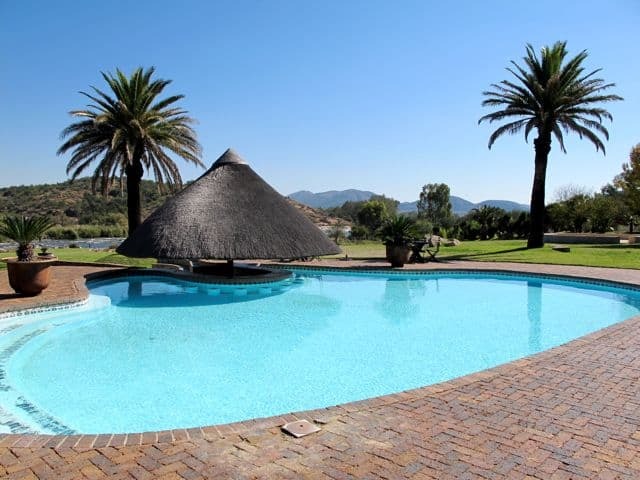 My fellow blogger, Simon, and I hopped into Bertrand’s car and he drove us past meadows, beautiful homes with well-kept gardens, broad tree-lined avenues and the picturesque Vaal River to the centre of Parys. 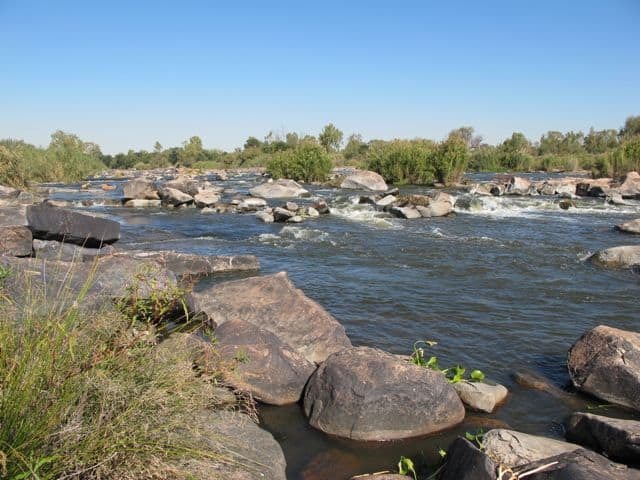 The town is best known for its many antique shops, restaurants, adventure activities (such as whitewater rafting, rock-climbing and abseiling) and golfing (Parys is home to two highly-rated golf courses located on islands in the Vaal River!). Bertrand smiled as he parked the car in front of a row of shops. “Here we are!” and he pointed to the photo studio in front of us. I looked at him quizzically. He noticed my expression and explained, “You’re so used to taking pictures everywhere you go. I thought it would be cool to flip things around and have pictures taken of you instead!” I took a deep breath and smiled back. 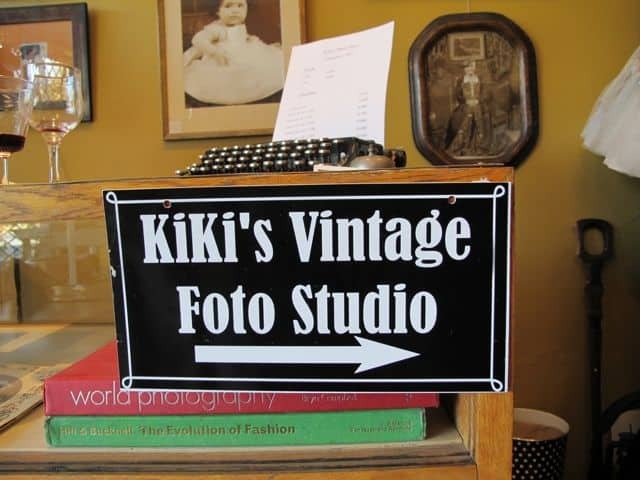 I had a good look at the board hanging above the entrance of the studio and read the words “KIKI’S VINTAGE PHOTO STUDIO” out loud. Bertrand laughed and assured us it was going to be fun. I quietly reminded myself to relax, keep an open mind and go with the flow. Inside the studio, Belinda, the owner, welcomed us with a glass of wine and proceeded to show us around her studio. It was a wondrous place, filled with antique furniture, clothing, cameras, bags and jewellery. The walls were covered with beautiful portraits of people dressed in a variety of styles. 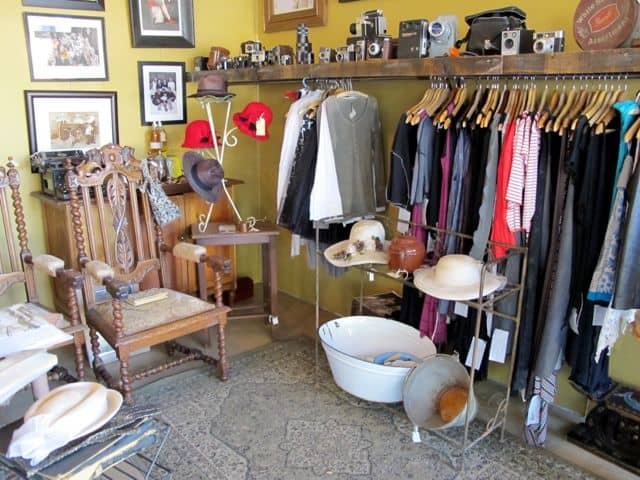 Antique furniture, cameras and clothing at Kiki’s. 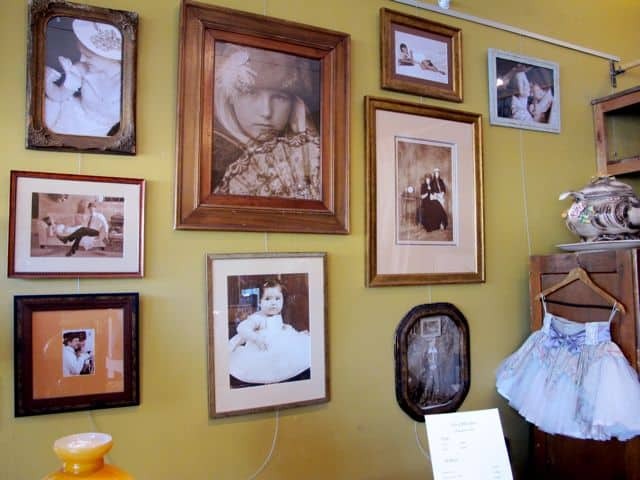 Vintage photos on the walls at Kiki’s. I asked Belinda what gave her the idea to open a vintage photo studio. She told us about her passions: collecting antique clothes and photography. 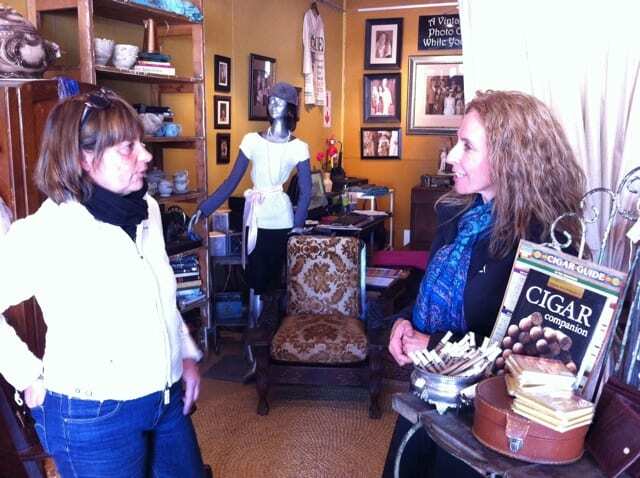 One day, she was having coffee with a friend and they talked about starting a new business in Parys. 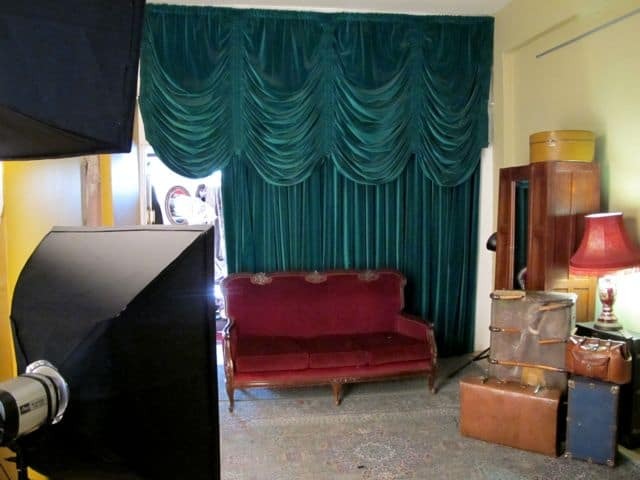 It didn’t take long before the idea of a vintage photo studio sprang to mind. Since the opening, she has photographed couples, families and friends. “People come here to have their photos taken for a special occasion like a wedding or an anniversary but there are also others who simply want to have a fun afternoon dressing up and posing for the camera. That’s the best part about this studio; it’s always filled with laughter”. It wasn’t difficult to feel drawn to the story – Belinda told it with great passion and enthusiasm. It was an inspiring story of how we can bring joy into the lives of others by simply doing things we enjoy most. Simon chatting with Belinda in the studio. Soon, it was time to dress up and have our photos taken. Simon and I voted for the Gatsby style! Belinda helped us choose our outfits and we started laughing hysterically when we emerged from the changing room. 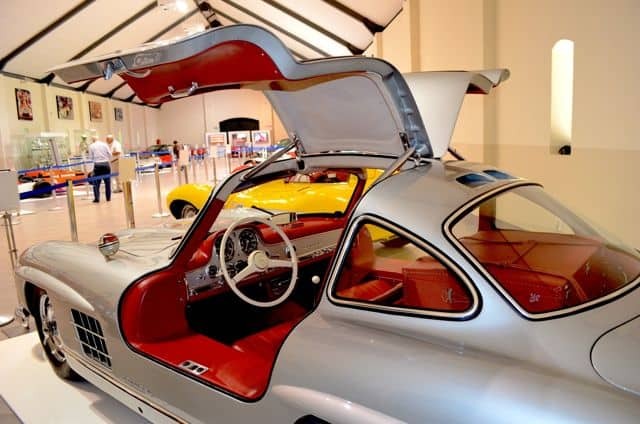 Check out the photos below and you’ll see why! The fun continued as we struck a variety of poses; Simon played a madame and I took on the role of her bellboy and photographer. It was a totally unexpected experience, one that I will not easily forget. We left Kiki’s Vintage Photo Studio feeling very inspired by Belinda’s story and with huge grins on our faces, all thanks to Bertrand! Belinda later gave me a CD containing the photos she took. This was my favourite. What do you think? We walked down the street, past a variety of antique and home decor shops. Bertrand explained that the antique business in Parys started when the farming community in the area started to sell their old furniture. The number of antique shops grew as word spread across the country, attracting hoards of antique collectors. 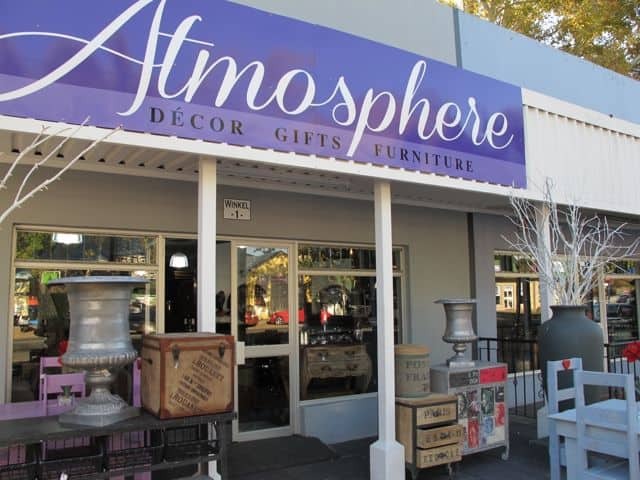 Stores along Bree Street in Parys. We soon found ourselves outside a curious-looking pub: the Pickled Pig. 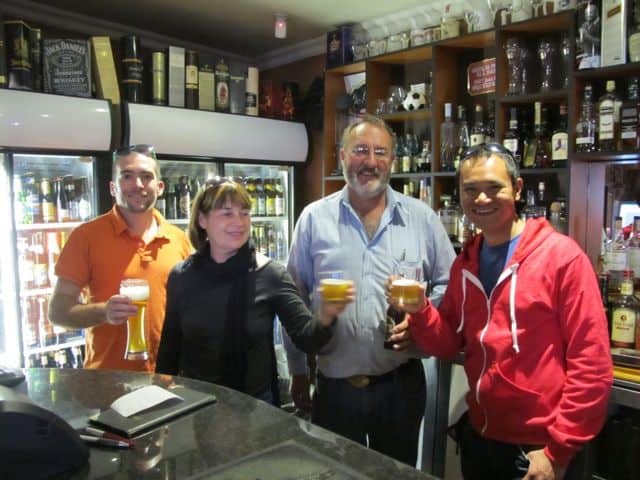 Bertrand told us about the nearby micro-brewery, De Garve, and that we could have a beer-tasting at this pub. Simon and I didn’t have to think twice! 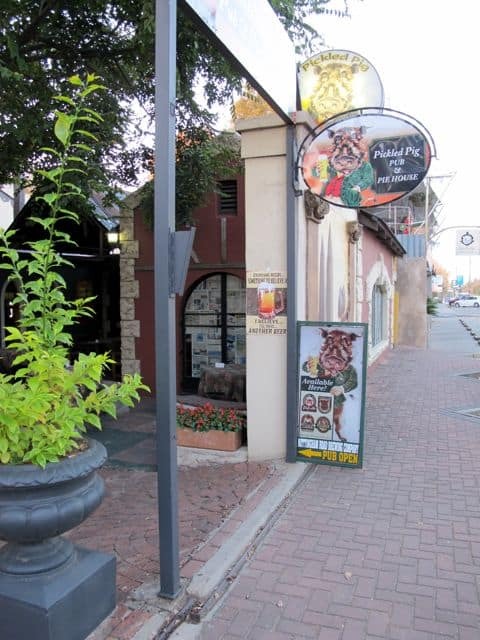 The Pickled Pig on Bree Street, Parys. We walked in and were greeted by the gregarious owner, Nico. He presented us with a menu describing the six beers. I’ve been to various beer-tastings at micro-breweries but the tasting experience at the Pickled Pig is certainly unique. Perhaps it was the warm welcome we received from the locals that made the difference. They made us feel right at home and chatted excitedly with us about travel and their country. Their enthusiasm and curiosity were undeniably infectious. Posing at the Pickled Pig with (left to right) Bertrand, Simon, Nico and me. The beers were delicious – my favourite was the Jolly Nun (an intriguing yet easy-to-drink Belgian-style ale with a distinctive bitter lemon finish). 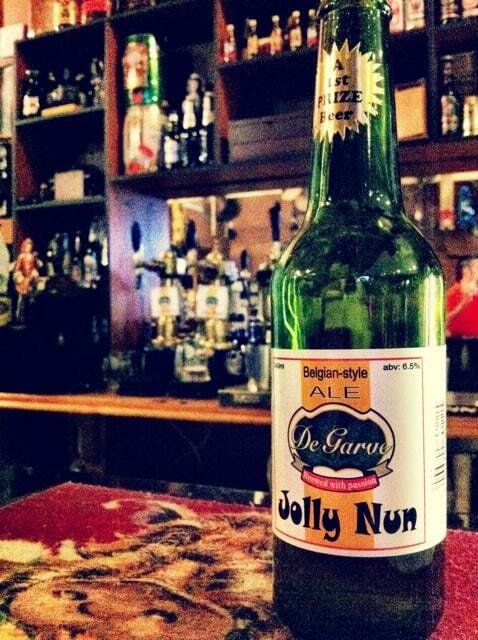 My favourite – the Jolly Nun! It was an unforgettable afternoon that was made very special by the fabulous hospitality of the locals. This was my fourth time in South Africa, a country that I fell in love with on my very first visit. I always wondered what it was that made this country so special. I certainly love its spectacular landscapes and nature, as well as its amazing array of food and wines but there was something else about it, something magical that keeps drawing me back. That afternoon with the locals in Parys gave me the final clue. The magic of South Africa is in its people and I’m thankful for people like Bertrand and Belinda for taking the time to share some of that magic with me. That afternoon was also a great reminder of the pleasures of the unexpected when we travel with an open mind. Ditching my preconceptions about Parys and simply going with the flow resulted in memories I will cherish for a long, long time. Oh… and in case you’re wondering… yes, we did get to see the Eiffel Tower in Parys! 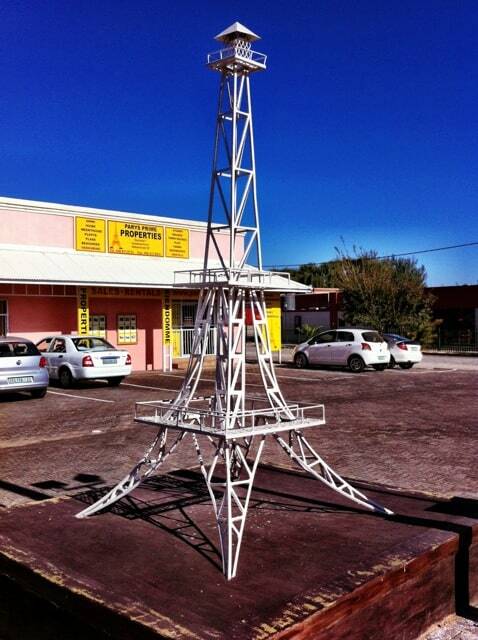 The quirky Eiffel Tower in Parys. There is a larger Eiffel Tower as well as the Arc de Triomf and the Luxor Obelisk at a factory in Parys. If you there when they are open you can go in and have a picnic in their gardens and take nice photos. Love the vintage pic of you, Keith! Ha not quite the Eiffel Tower I was expecting, but I appreciate them sticking to the theme! Looks like a really fun time. Great article Keith. It was a fun day for me as well. We enjoyed meeting you all. It was a pleasure sharing Parys with such nice people. You look rather handsome in the antique outfit, such a fun article about Parijs! Thanks William! The people of SA made us feel so welcome, even via social media. It was a truly special experience. There are so many great little, and also not so little surprises to be experienced all over our awesome country. So glad that you had such an inspiring day! 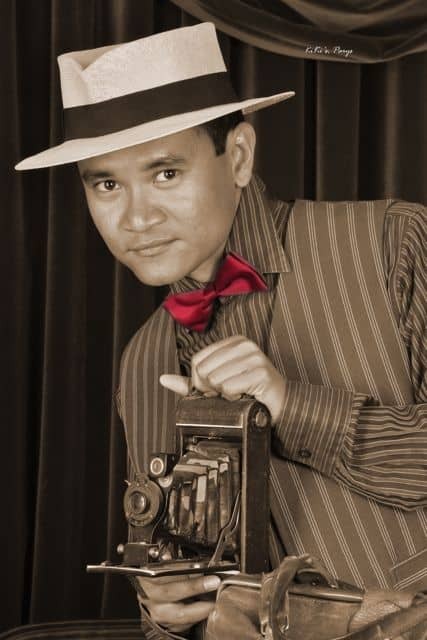 I love that vintage photo studio! The “Eiffel Tower” looks like a miniature oil rig! Wonderful memories of such a special, unique and unexpected afternoon. I’ll never forget how much fun we had in being dressed up ‘Gatsby Style’ and how much we laughed! Definitely one of the best moments in South Africa!